Драматична комедія Бенедикта Ерлінгссона «Жінка на війні», створена у копродукції Ісландії, Франції та України, здобула кінопремію Європейського парламенту LUX Prize 2018 року. Церемонія нагородження відбулася 14 листопада 2018 року. В українському кінопрокаті фільм йшов під назвою «Гірська жінка: На війні». 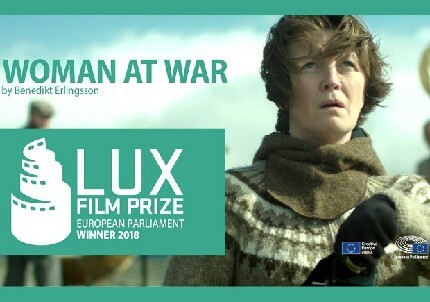 Vice-President of the European Parliament Evelyne Gebhardt and Chair of the Committee on Culture and Education Petra Kammerevert have also presented recognitions to the runner-up films – Styx came in second, while The Other Side of Everything came in third. The ceremony was the highlight of the event organised by the LUX Prize in Strasbourg. Yesterday, a media round-table was held on the premises of the European Parliament, with the participation of the directors of the three finalist films, to focus on how cinema can raise awareness and prompt debates within civil society while also stimulating legislators to take action.